The Amarillo Sod Poodles, in conjunction with Townsquare Media in Amarillo, announced today that the two have agreed to an inaugural radio partnership for Townsquare Media to broadcast the Sod Poodles 70 home and 70 away games for the 2019 season. 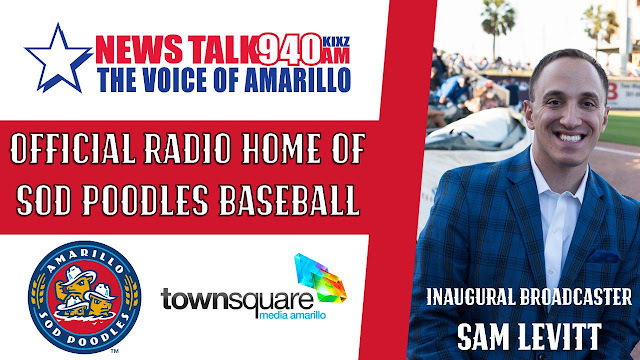 Townsquare Media's KIXZ-940 AM is the flagship station and the official radio home of Amarillo Sod Poodles baseball games. The broadcast will be hosted by the first "Voice of the Sod Poodles", Sam Levitt. As part of the agreement, KIXZ-940 AM will broadcast all 140 regular-season home and away games as well as all postseason playoff contests. Each game will begin with a 15-20-minute pregame show. Fans from across the local area will be able to listen to every Sod Poodles game on the radio. In addition to the radio broadcasts on KIXZ-940 AM, all Sod Poodles games will also be streamed live over the internet with Listen Live links available on SodPoodles.com and station website voiceofamarillo.com. The broadcasts will also be streamed through the KIXZ-940 AM mobile application. "We are really excited to partner with Townsquare Media to broadcast Sod Poodles baseball and have all of our games heard all across the Texas Panhandle and beyond," said Sod Poodles President and General Manager Tony Ensor. "We have a tremendous inaugural season coming up at Hodgetown and we look forward giving Amarillo and the surrounding communities full access to pitch-by-pitch updates on our home station!" "Townsquare Media and our five broadcast stations are extremely excited to be partnering with the Amarillo Sod Poodles for the 2019 campaign," said Townsquare Media Market Manager Brice Sheets. "We value this partnership and what this organization is bringing to the city of Amarillo, the Texas Panhandle and beyond! It is with great excitement that we will be able to provide a platform to hear Sod Poodles baseball both home and away for 2019! Great baseball fans can listen on 940 KIXZ, the KIXZ App and VoiceofAmarillo.com." Levitt will serve as the team's inaugural broadcaster, who spent the past two seasons as a member of the broadcast team for fellow Texas League team, the Corpus Christi Hooks (Houston Astros Double-A). With the Hooks, he served as a radio play-by-play broadcaster while also handling all web and social media content hosting duties for the organization. Prior to joining the Texas League, the Northwestern graduate was the Director of Broadcasting & Media Relations for the Gateway Grizzlies, a Frontier League team located in the St. Louis market. He joined the team in 2014 and was promoted to Director of Broadcasting & Media Relations for the 2015 and 2016 campaigns. During this time, Levitt was also the play-by-play voice of women's basketball at Division I Southern Illinois Edwardsville, while also filling in for various men's basketball games. "We are proud to announce Sam as our inaugural team voice," said Ensor. "Not only will Amarillo be getting team insights, play-by-play coverage, and fantastic story-telling with his experience in the Texas League, but also one of the most exciting up-and-coming talents in the game inside and out of the booth. We will be elevating our broadcast to a new level through social media and community engagement. Sam will be a huge asset to this new concept in the game that will really enhance the fan experience all-around!" "I'm incredibly excited to join the Sod Poodles and be part of starting a new chapter of professional baseball in Amarillo", said Levitt. "It's a very unique opportunity. I truly want to create a connection with Amarillo fans both by what I provide on-air and outside the broadcast booth as a member of the community. The San Diego Padres will provide top-level prospects and make it an exciting team to cover every day." Levitt added, "My goal is to provide this fan base with some of the best coverage in the Texas League and all of Minor League Baseball, from our radio broadcasts to creative presence on the web and social media. I want fans to feel connected to the organization in a meaningful way, both when the team is at home and on the road. Our broadcasts will play a significant role in creating that bond." The New York City area native also serves as a play-by-play broadcaster on a variety of TV and digital platforms for sports such as basketball, football, baseball, softball, volleyball, and soccer. Outlets have included ESPN3, ESPN+, Spectrum Sports Texas, Big Ten Network, NBC Sports Chicago, and many Division I athletic programs around the country. He has called games for a number of Texas universities, including Lamar, Sam Houston State, Rice, Texas A&M Corpus Christi, and UT Rio Grande Valley. Levitt also called the Corpus Christi area "High School Game of the Week" for the Texas Sports Radio Network during the 2017 football season.